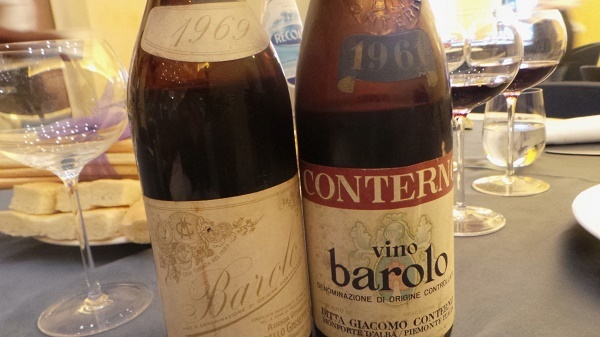 What a joy it is to taste these two glorious 1960s Barolos, both at the peak of their splendor. Very little knowledge remains about the 1969 vintage in Piedmont, although all of the sources I have consulted describe it as a weak vintage. I have tasted only a few 1969s, so my interest is piqued by this impeccably stored bottle of Giuseppe Mascarello’s 1969 Barolo. Still deeply colored for a wine of its age, the 1969 is beautiful. Deep, powerful and a bit burly, the 1969 possesses tremendous balance as well as personality. The bouquet is perhaps not as perfect as it could be, but that is a relatively small critique for a wine that delivers so much pleasure. The cool, rainy growing season yielded high acid wines that have aged impeccably. That is certainly the case here. The 1969 was made during the transition from Giuseppe to Mauro Mascarello. At the time, Mascarello made only one Barolo, a blend of fruit sourced from a number of parcels throughout the region, including the family’s own Monprivato. The 1969 Barolo has weathered the test of time impeccably. Today is a gorgeous wine that captures the austere classicism of the era. 92/Drinking window: 2014. Conterno’s 1961 Barolo is pure magic in the glass. A wine from the pre-Cascina Francia era, the 1961 graces the palate with exquisite finesse and total class. At times the 1961 is quite feminine and ethereal, while in other moments the pure power of Nebbiolo softened by age is more evident. Captivating and totally alluring from the very first taste, the 1961 is absolutely singing today. There is no further upside to be gained from further cellaring, although perfectly stored bottles will continue to drink well for another few years. At 53, the 1961 is a drop-dead gorgeous beauty. What a treat it is to taste and drink the 1961. 94/Drinking window: 2014.